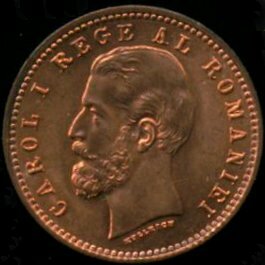 denomination "2 BANI", ROMANIA, year 1900, Romanian coat of arms, letter B and wheat ear, the signs of Romanian mint, outer pearl circle inscription "CAROL I REGE AL ROMANIEI" meaning "KING OF ROMANIA" and CAROL I head facing left, outer pearl circle. Under the neck lies KULLRICH, the engraver's name. 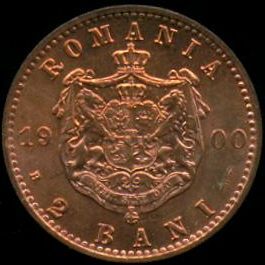 Although bearing the Romanian B (standing for Bucharest), the 2 bani coins from 1900 were struck in Hamburg. During the reign of Carol I, likewise in the kingdom, coins of 2 bani were struck in 1882 too. The former belong to a another type, differing from the later in their 5 bani like obverse (5 bani from 1882, 1883, 1884, 1885), i.e. mainly the lack of word Romania and the differently engraved coat of arms (winding tent braids, distinctness not restricted only to fringes though). The brilliant uncirculated coin pictures above are present on Romanian coins through the kind permission of an anonymous donor.